Through the use of teleradiology, we are able to connect to our clients from any location. 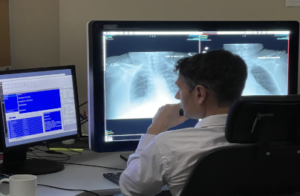 The broad range of sub-specialty trained radiologists within Radiology, Inc. allows us to cover all services provided in most outpatient and inpatient settings. Hospitals and other radiology groups utilize our teleradiology service for specialty interpretations, overnight imaging services and assistance with overflow when scheduling and coverage gaps occur. Many have found teleradiology particularly beneficial because it allows the same high quality, quick turn-around, professional interpretations on a 24/7/365 basis.